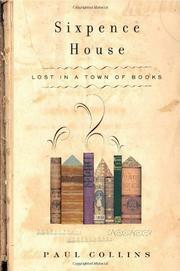 Entertaining memoir of the expatriate author’s retreat to a bookish town in Wales. Desperate to leave San Francisco because they can no longer afford to live there with their newborn son, Collins and his wife sell their apartment and, seemingly regardless of employment prospects, remove themselves to the Welsh town of Hay-on-Wye (pop. 1,500), where he intends to pursue a writing career. Owing to an eccentric and well-heeled entrepreneur’s desideratum, the town has become the used-book capital of the world. The author is fortunate enough to bump into the used-book tycoon, who offers him a minimum-wage part-time job. Collins accepts, but it doesn't work out. When he and his family cannot find a house to their liking in Hay-on-Wye, they elect to chuck it and return to America. Since they’ve made some fairly substantial purchase offers, we have to wonder if they are as hard up as they claim. Nevertheless, Collins (The Modern Inquisition, 2002, etc.) has an engaging manner, and the depiction of his adopted Welsh town is informative and amusing. Emulating the style of P.J. O’Rourke, albeit not quite as successfully, he writes hilariously of publishing, contrasting “diminutively sized hardcover books . . . aimed at the educated” with books on which “a color photo of the author [occupies] the entire front cover” that are “unequivocal crap.” We are also in the author's debt for introducing us to such undeservedly forgotten literary lights as Erik von Kuehnelt-Leddhin. A treat for the bibliophile.